There’s only one way to come face to face with the mighty Niagara Falls on the US side–an unforgettable boat tour aboard the Maid of the Mist. Millions of people including famous personalities from all over the world have enjoyed this breath-taking boat ride to experience the power of the falls. 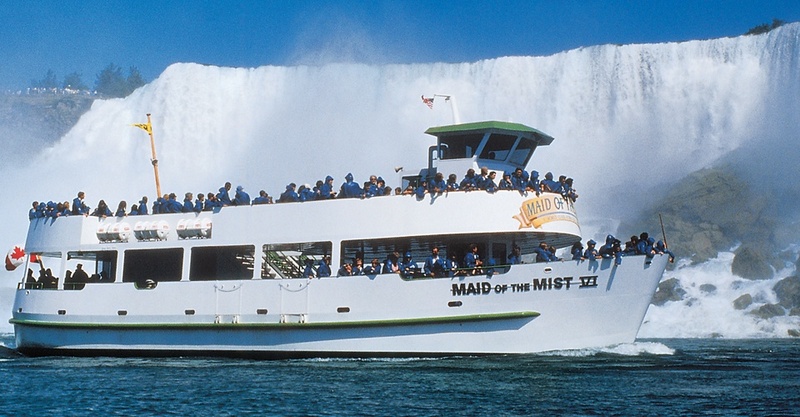 Ferrying passengers since 1846, the Maid of the Mist is a legend unto itself. Initially, it was used to transport people and cargo but soon became a sightseeing attraction. In 1885, the steamboat ventured closer to the Horseshoe Falls than any other boat before it and this became the highlight of the trip. Its success spawned more boats down the decades and it became a major attraction for the increasing hordes of tourists. The boat tour continues to draw in the crowds to this day and a trip to Niagara Falls, New York, USA is incomplete without it. As the years passed, the boats became bigger, better, more powerful and today, the Maid of the Mist can accommodate 600 passengers. To enjoy a ride aboard the Maid of the Mist, you need to head to the Observation Tower at Prospect Point in the Niagara Falls State Park. Tickets are available separately or as part of the Niagara Falls USA Discovery Pass. The base of the tower is the boarding point for the 20 minute boat ride. All visitors are given blue raincoats as the boat ventures very close to the falls with spray falling all over. Once aboard, the fun begins with a ride on the River Niagara along the Niagara Gorge. Soon after, the boat approaches the American and Bridal Veil Falls. Watch the tons of water gushing down the American Falls, and enjoy the view of the smaller but equally wonderful Bridal Veil Falls. Both of these tumble down side by side and you can see the waters falling from very close quarters. The boat then heads towards the spectacular Horseshoe Falls. It’s a thrill to view the massive falls with the wind in your face, and the water swirling all around the boat. As soon as the boat moves into the basin of the falls, you can see beautiful sheets of water cascading down right in front of you from a great height. The tons of water with its thundering sound gushes down from the crescent-shaped edge and crashes into the river below. You feel the spray of the water falling on you and it’s like being right under the falls. It’s a sight that you will remember forever because you are in the presence of something powerful, beautiful and magical. Don’t forget to take photographs as the river, gorge and the spectacular falls offer hundreds of photo opportunities. As the boat makes its way back to the shore, it’s time to take in some more wonderful views and appreciate all the beauty that you have witnessed. It’s a ride that you will talk about for a long time to come!